As a resident of Rhode Island, you and your family have access to a statewide Prescription Assistance Program (PAP). This pharmacy coupon card will provide you with Rx medication savings of up to 75% at more than 68,000 pharmacies across the country including CVS/pharmacy, Walgreens, Walmart, and many more. It is free for everyone and there are no restrictions. This program uses the Lowest Rx Price Logic to guarantee the lowest prices on brand name and generic medications. No personal information is required to get a card, so print yours out today! 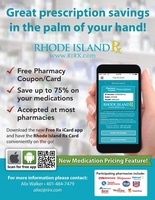 If unable to print a member card, you can visit any preferred pharmacy location and ask to have your prescription processed through the RI Rx Card.